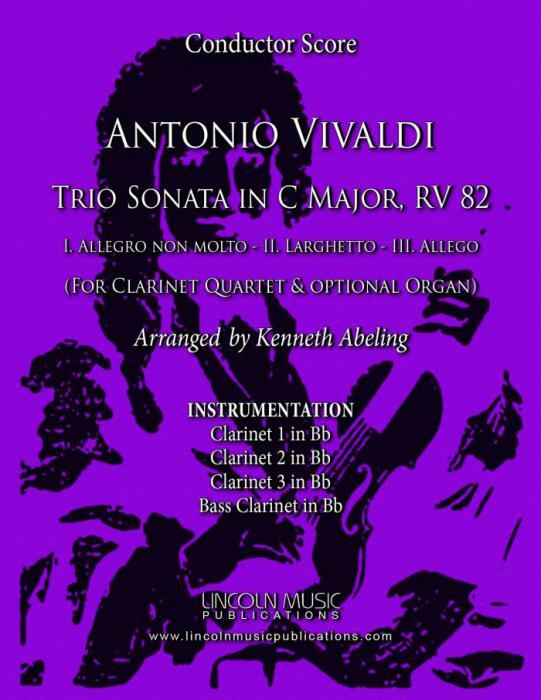 Trio Sonata in C Major RV 82 by Antonio Vivaldi and arranged for Clarinet Quartet by Kenneth Abeling. This piece was originally written for Flute, Lute and continuo and later transcribed for Guitar and Chamber Orchestra and Harpsichord in A Major. This is a more advanced arrangement but not totally out of the musical reach of less experienced ensembles and may be performed without the Organ. Playing Time 9:25 with repeats and 6:25 without.